Toyota issued three safety-related recalls Thursday covering 430,500 vehicles sold in the United States, as the auto industry continued on pace for an all-time recall record this year. The largest of the three new recalls covers 370,000 Toyota Sienna minivans sold between the 2004 and 2011 model-years and registered in colder climate states. The problem centers around corrosion that can be triggered by road salt and can cause the spare tire of the vans to fall off if their supporting cable rusts out. The tires are stored under the vehicle and a foam splash protector in front of the spare tire carrier may actually wind up allowing high concentrations of salt to build up and eventually corrode the spare tire carrier assembly. Toyota has had several large recalls related to excess corrosion in recent years, including actions targeting the Japanese giant’s Tacoma and Tundra pickups. 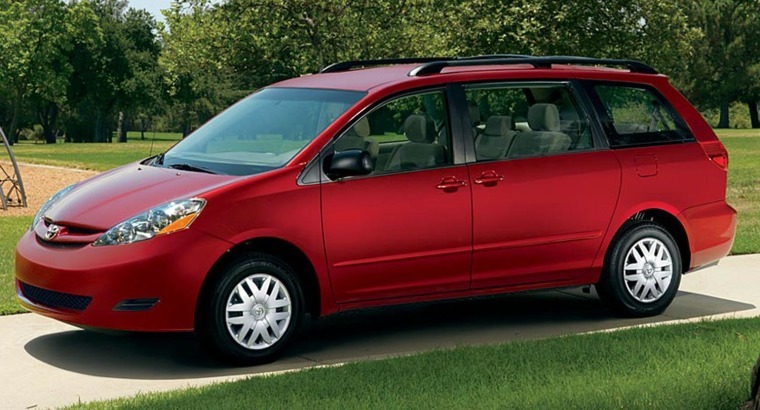 Toyota also had previously recalled some of the Sienna minivans in April 2010 for a similar problem. The second recall covers 50,000 Toyota Highlander and Highlander SUVs from the 2014 model-year. The Highlander uses a "smart" airbag system designed to distinguish between large adult males, small women and children. That can affect how fast the airbags inflate, if they inflate at all, depending on the severity of the collision. But a software glitch may result in the bags not inflating properly. The third recall covers 10,500 2013 Lexus GS350 sedans. A sensing switch designed to sense when a driver has applied pressure to the brake pedal may inadvertently activate on its own. If that happens, the car could begin to decelerate unexpectedly, and without the brake lights coming on to warn other drivers. That could lead to a rear-end collision. The maker says it knows of no accidents, injuries or fatalities connected to the problem. Is GM Reviving the Hated Seat Belt Interlock?